Dude Perfect has pushed the limits of what is possible on the Internet. What began as a backyard bet, has evolved into the #1 sports channel on YouTube, captivating millions of fans from around the globe. 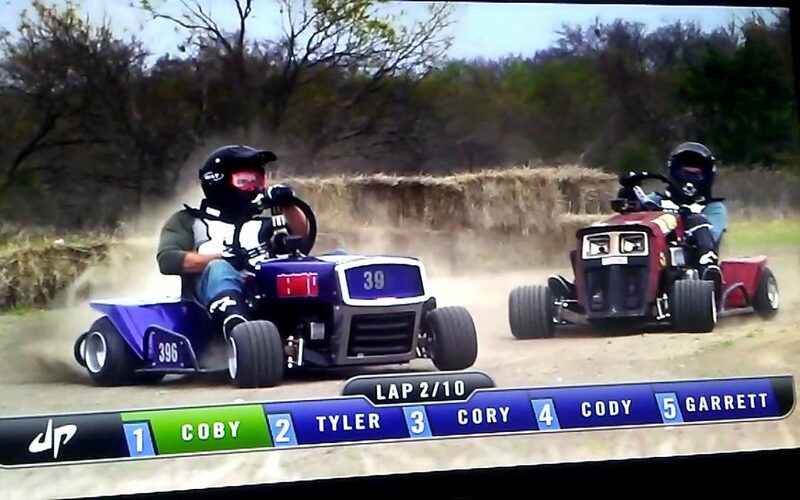 For Episode 105 (airing this week, see times below) The Dudes shot the episode in Gun Barrel City, Texas, named by the Lone Star Lawn Mower Racing Association as ‘Best Racing Venue’. This clip, featuring Michael Howell preparing The Dudes for the segment, ran on the CMT YouTube Channel… enjoy! In this show, you’ll meet the five guys behind the viral magic: Tyler, the bearded guy; Cody; the tall one; Garrett; the purple hoser; and Coby and Cory, the twins. Operating from their Dude Perfect headquarters in Frisco, Texas, Dude Perfect has the job every kid dreams of. Whether it’s working with celebrity guest stars like Luke Bryan, Dale Earnhardt Jr and Aaron Rodgers, or prepping for their next battle video, Giant Basketball Arcade, Lawnmower Race or Epic Snow Battle, these guys have made a career out of having fun. With more than 23 million fans and followers, 1 billion online video views, and the #1 Sports Channel on YouTube, Dude Perfect attracts fans from around the globe. In their first-ever TV series, the dudes will open the doors to their mancave in Dallas, Texas to showcase exactly how they cook up their next crazy idea. Part comedy and part live-action, the series will showcase the guys’ “Go-Big” mantra in their unique world of sports stunts, crazy fun interactions with some of the world’s biggest athletes and celebs, and their all-out hilarious friendship that has made the Dude Perfect guys so beloved by all ages.